Wow, what do you know? 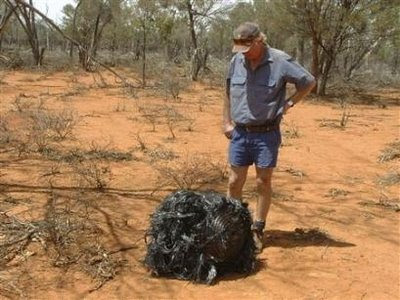 Yet another animal that is on the brink of extinction due to demand for its parts in 'traditional' Chinese medicine. 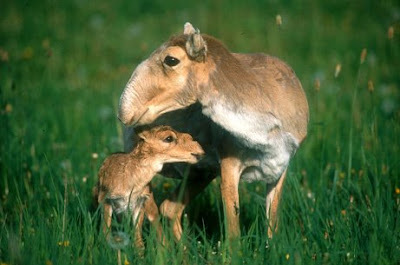 Say hello to the saiga (aka big-nosed antelope, Saiga tatarica), of the steppes of Central Asia. The next time you need an aphrodisiac, please read the label and make sure it doesn't contain saiga horn. I've heard snake oil works much better. 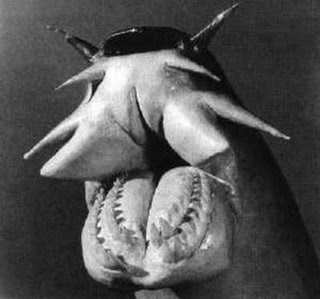 There is debate as to whether or not the hagfish (Myxini sp.) is a true fish. One thing that is not in debate, however, is their hideousness. These monsters can exude copious quantities of sticky slime when captured or threatened (this slime, to my horror, can actually be used as a substitute for egg whites in baking). Once the threat has passed, they have an unusual means of cleaning off said mucus. They tie themselves into an overhand knot, which then works its way down the animal, head to tail, thereby scraping off the slime. They then flick the slime off the tip of their tail in a derisive, haughty gesture. That's a stunt I've seen in some cartoons, but never thought actually possible. I'd like to see a boyscout master one of these travelling knots. Thanks for the photo, Kris. As a flawed human being, I take a bit of pleasure in seeing the flaws in others, even in insects. Ants, who are so often praised for their social cooperation, may not be as perfect as we think. Researchers have recently uncovered evidence that individual ants can be as corrupt and selfish as me (and the rest of humanity). 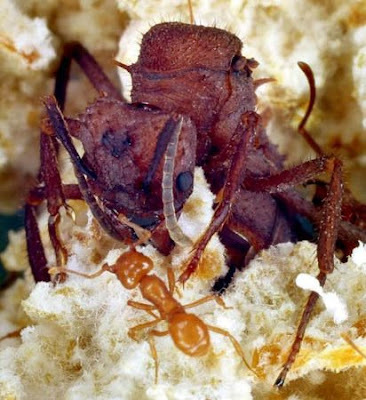 It seems that some ants are able to cheat the ant system and ensure that their own offspring become reproductive queens as opposed to sterile works (queen and worker seen below). I'm reminded of the pageant mother who parades her daughter about in adult clothing and makeup for her own aggrandizement, the football coach who always keeps his own son in the starting lineup, and the boss who promotes his son over more qualified individuals. I've always enjoyed posting on deepsea gigantism and on new oceanic finds. This post is a double dose of joy. Scientists have recently conducted the most comprehensive survey to date of New Zealand's Antarctic waters. 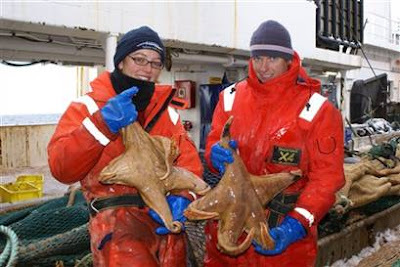 While exploring the Ross Sea, they came across expansive fields of sea lilies, huge sea snails, large sea spiders, jellyfish with 12-foot tentacles, and 2-foot-wide sea stars. Why do polar waters, much of which has never been seen by human eyes, yield such large creatures? There is no one answer, so here are several: cold temperatures, not many predators, high levels of oxygen, and longevity. 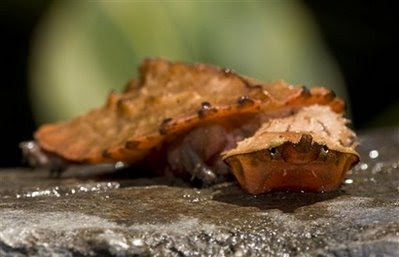 No doubt, if they were found in shallower, warmer waters, they'd be deemed either a delicacy or an aphrodisiac, which would cull their numbers (and size) in two shakes of a sea star's tubercles. Marty alerted me to a news story out of Australia. 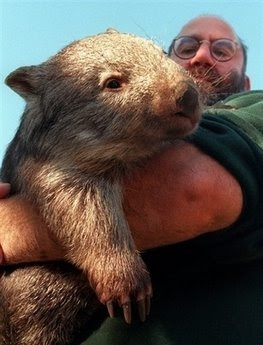 It seems that a man called the police to report that he had been...had...by a wombat, in a way no one should be had by any anything, much less by a large marsupial. The man, who is a self-proclaimed alcoholic, later called back to say that he was all right, and that the incident hadn't been painful, but had in fact given him a spontaneous Australian accent. He was sentenced by the Australian court to 75 hours of community service for distracting emergency and law enforcement personnel. I comment on this news story only to come to the defense of slandered, wrongfully accused, and disparaged wombats the world over. This man should have to serve in some sort of of anti-defamation league for wombats (and their raging cousins). In my digging around for Sumreen's tapirs, I came across this gem. These two tapirs share their enclosure with another unlikely pair: a couple of capybaras. 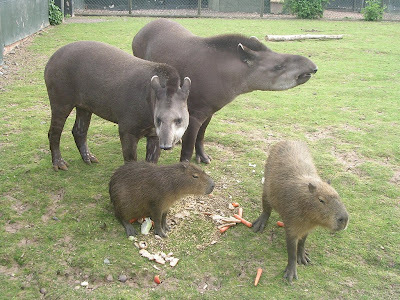 This photo looks like it comes from some alternate dimension, where the rodents are oversized (100 lbs in the case of the capybara), and where pigs have coats, manes, and prehensile snouts. But these creatures don't come from an alternate dimension. They come from an alternate hemisphere (from me, at least). 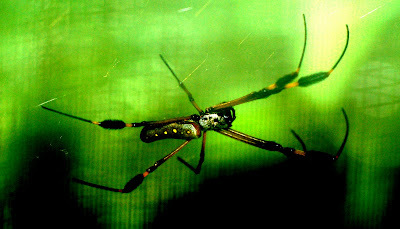 K is back with her web-building freaks. She was given special permission by the staff at the Lincoln Park Zoo to access and photograph their Madagascar Giant Silk Spiders. inches from legtip to legtip! Many more posts like this, and talk of 6-foot, industrial-strength webs, and I'll become a permanent gibbering mass in the corner of the room. I thought this blog would be cathartic, but I was so wrong. 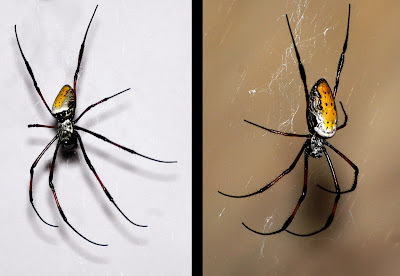 The photos below are: 1) a set of the Madagascar spiders, and 2) the Costa Rican spider. Thanks for the photo, K. My skin is crawling. Sumreen requested that I post on a tapir and a tapir's tongue. Well, I aim to please. Here is tapir and a tapir's tongue. I'm not good enough with tapir taxonomy to know if this is of the mountain or lowland (Brazilian) variety. The photographer identifies it as both a mountain tapir (Tapirus pinchaque) and a Tapirus terrestris (lowland tapir). Both species hail from South America. The northern Andes are home to the mountain tapir, and the Amazon basin and its surroundings are home to the lowland tapir. Though they have pig-shaped bodies, their closest relatives (aside from the Baird and Malay tapirs) are the odd-toed ungulates (think horses and rhinoceroses). 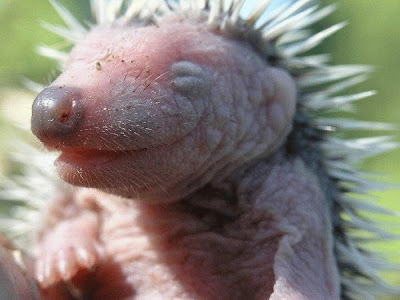 They are large animals (upwards of 7 ft, 700 lbs), famous for their adorable babies and their prehensile snouts. 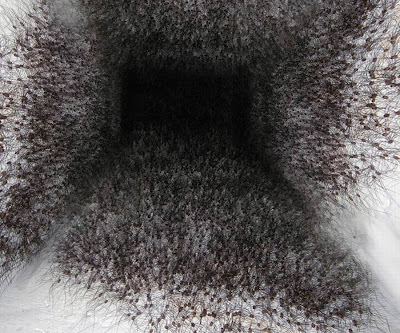 But, in the end, it is the snout that most serves the purposes of this blog. 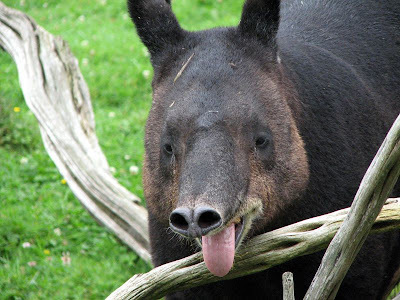 I hope this gives you your tapir tongue fix, Sumreen. The thorny devil (one of my favorite reptiles) has a rare ability. They can drink water through their feet. Materials engineers are studying the thorny devil to see how they can duplicate this ability. It seems that these lizards are able to wick moisture through cracks in the scales of their feet. My feet (due to being sock-bound for most of my life) are also scaly and cracked. I never imagined there might be an industrial use to my foot ailments, but now I see an opportunity. I plan on heading over to the engineering department of my local university and presenting my feet to the staff and students. You won't find the sea cucumber in your average side salad, body lotion, or sliced up and placed over your eyes in a salon. No, this echinoderm (related to the sea star and sea urchin) has other charms. 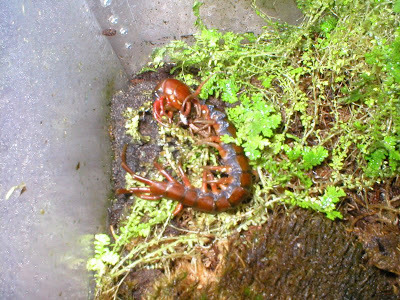 This creature first captured my attention as a boy when I found out that they disgorge their viscera (puke up their guts, literally) when threatened as a means of distracting (and possibly harming) their would-be prey. 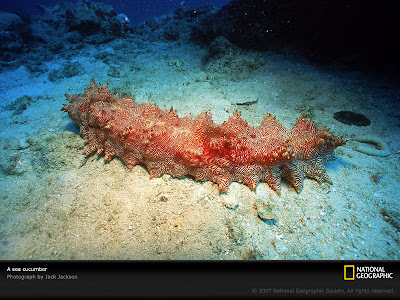 For years I wanted one as a pet, if for no other reason than to be able to put sea cucumber innards in my sisters' beds. But it was not meant to be. Such are the disappointments of a big brother. I seem to recall that smaller varieties of the sea cucumber (there are ~1,250 species of them) can be kept in saltwater aquariums. You just better hope that they don't pull their evisceration stunt. The goop they upchuck is toxic and will kill your livestock off. Thanks for the photo, Ida. I'm going to pass on a salad today. 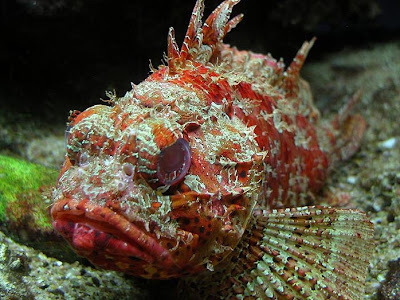 Behold the ill-tempered and poisonous scorpionfish. I'm not sure which variety of scorpion fish this is (after all, the saltwater aquarium staple Lionfish is a scorpionfish), but the Germans call it the Grosserdrachenkopf, which I think (if my high school German classes still serve me) means Greater Dragonhead. If that is the case, then I am very much enamored with this fish, venom and all. Any German speakers out there want to correct me? Rasmus (this is right up your alley, Mr. Ichthyologist)? UPDATE: Rasmus has affirmed that my German skills remain (marginally) intact. Frau Fetzer would be so proud. What a nice, tranquil bayou setting. Can't you just hear the twitter of birds in the evening and the lulling buzz of the cicadas? Ahh. But don't let your guard down. 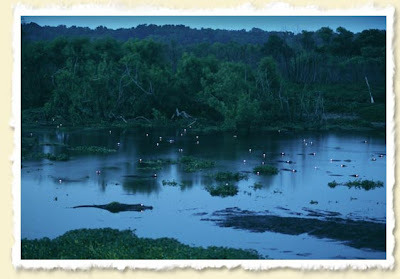 Every one of those pinpoints of light belongs to an alligator. And they're looking at you. Thanks for the photo, Theodosia. 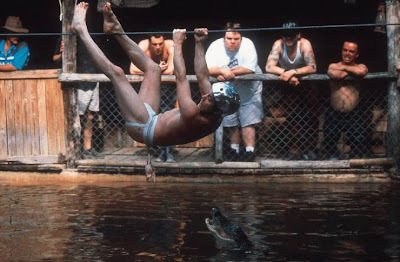 The matamata turtle has been a frequent guest on Ugly Overload. And I am happy to announce the first captive birth (well, breeding and hatching) of this species in the San Diego Zoo (see hatchling below). The world needs more "it kills, it kills" turtles. 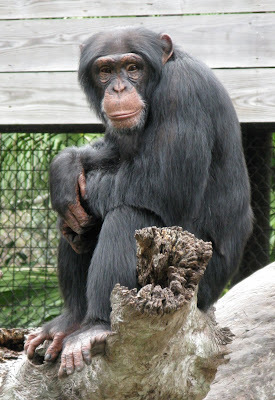 Mary the zookeeper has sent us a couple of photos from her chimpanzee enclosure. The second photo demonstrates just how close we as humans are to our chimp cousins. Mary's boyfriend plans on getting a new comforter for his bed. 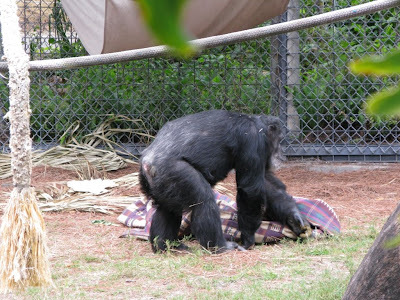 So she found it quite amusing to walk by the chimp compound and find one of them playing with a comforter that is identical to her boyfriend's. It would seem that humans can share, in addition to most of our genome, a similar fashion sense and preference in bedding with our simian friends. Peer sent me this video of an unidentified sea creature off the Florida coast. Any marine biologists care to ID it for us? It might be, as Peer pointed out, a strand of zombie intestines. But that's just a guess. Competition is fierce in the animal world. This is no less true among wasps. The problem, however, is that if every wasp had to fight every other wasp for dominance, then all you would end up with is an injured population of champions and opportunists. But Mother Nature has found a way to cut back on all the fighting. Elizabeth Tibbetts, a behavioral ecologist at the University of Michigan at Ann Arbor, has discovered that paper wasps (Polistes dominulus) have facial markings that are used as signals to other wasps. The larger and better fed a wasp is, the more black markings the wasp has on its face. 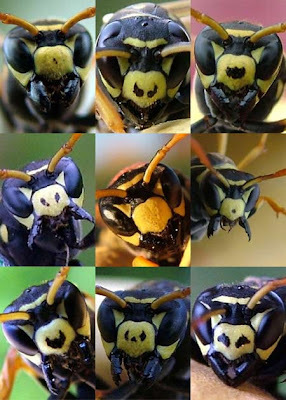 These markings function as warning signals to other wasps, telling them that they might not want to tangle with the black-faced insect facing them. I recommend reading the whole LiveScience article. Prepared to be marveled by the complexity of nature. This discovery has led me to consider my own facial markings during my teenage years. I now understand why my acne warded off females for all those lonely years. 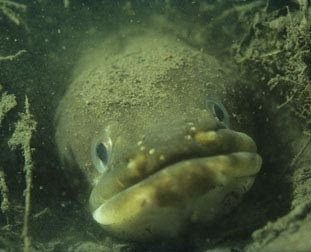 You're looking into the lippy face of the European eel (Anguilla anguilla). 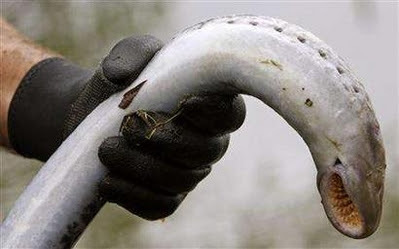 These freshwater eels are under threat. Their population looks to be down 90% since the 1970s, though it seems there isn't a consensus in the scientific community as to why (or any single cause). As a side note, their young are so transparent that you can read a "newspaper through them". My little brother, who hasn't seen the sun since he discovered the PS3, is nearly as see-through. 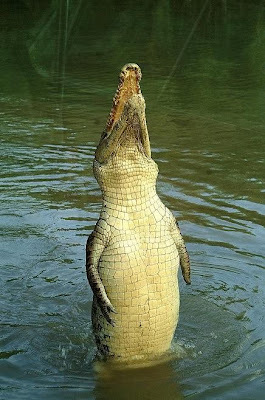 I'ts time for another round of leaping crocodiles (and alligators?). 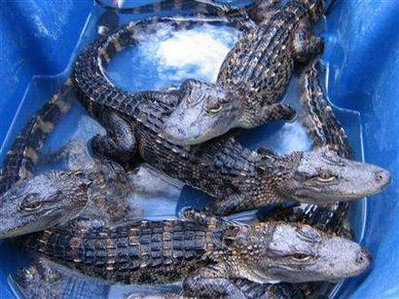 In a related story, wildlife officials in West Bengal, India, have been releasing captive bred, endangered crocodiles into their native mangrove forests. But these aren't your average crocs; they've been specially trained to attack poachers and boats. The program is working. Poachers are much more leary of entering the croc-guarded mangrove forests, and villagers aren't as eager to cut down the mangroves for fuel. Crocodile attacks are on the rise. I understand the need for aggressive programs to protect animals that are under threat of extinction because of humanity. But if you add in a splash of genetic engineering, you have the makings of the next Michael Crichton novel. I'm not sure how the third photo made its way into my post. Probably just wishful thinking. 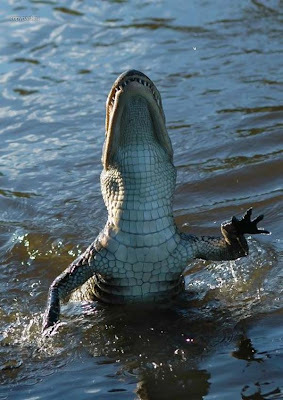 Yesterday a team of US researchers reported their findings that American alligators use their diaphragm, pelvic, rib, and abdominal muscles to shift their lungs around to aid in swimming. They shift their lungs towards their tail when diving, towards their head when surfacing, and to the side to roll. That's part of how they glide through the water with nary a ripple. That is buoyancy control! They're like reptilian submarines diving and ascending for the kill. I perform a similar feat with those same muscle groups in an effort to fit my belly into my pants. But I don't need a team of scientists to confirm this. Do we really need to know the backstory here? I think we all can assume that the baboon is at fault, and probably deserves what's coming to him. 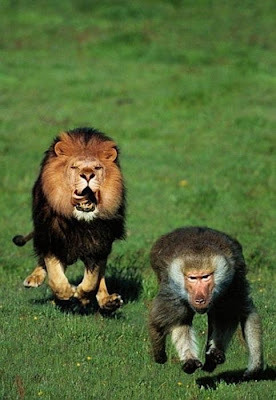 The baboon doesn't look pleased, and I don't know if he got enough of a headstart on Mufasa. If it's any comfort to the monkey, Elton John once told me that this is just the Circle of Life. And a lion's gotta eat just like everyone else. I'm sure that's exactly what's going through the baboon's mind right now. I've see a lot of mantis manifestations since beginning of this blog, but I think this is the first photo of one where I felt a bit intimidated. The wings, the arms, the alien eyes. Even though I'm bigger, stronger, smarter, and not held captive in a glass terrarium (and I'm much more handsome), I think I would still tuck my proverbial tail between my legs and scamper away if I were confronted with this. Thanks for the photo, Ida. I now feel less of a man. That's always a pleasant experience. I have to get these two out of my system (both figuratively and literally). I've been holding on to them for a while, trying to find a good excuse to post them. The problem is that they straddle the ugly - cute fence too much for my liking (I live in a very binary world). So here goes. 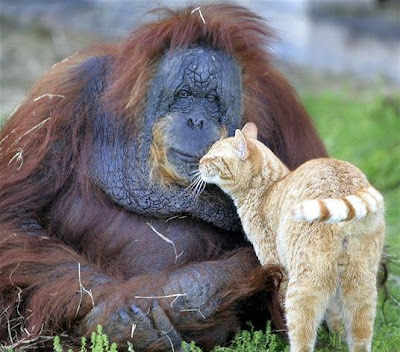 Enjoy an orangutan being rubbed by a cat and the smiling face of a juvenile hedgehog. Don't hate me, you ugly purists. I'm surprised this hasn't received any news coverage. But evidently, we've unearthed the Portal to Hell. And, not to my surprise, it appears to be guarded by countless daddy-long-legs (harvestmen). 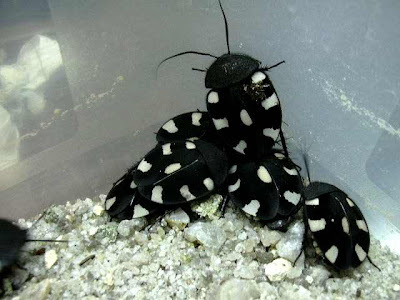 If you're looking into becoming an invert owner, and cockroaches and centipedes just don't cut it for you, you might want to look into getting your hands on some Domino roaches. But there's a catch: they're very rare in the US. Jade just might be your best source for them. 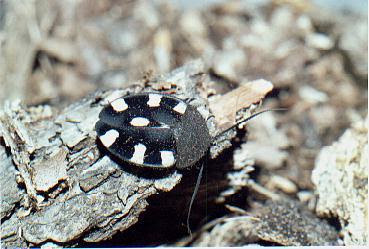 Domino roaches (Therea petiveriana) are docile and and easy to work with. The complication with breeding them is that their breeding cycles are 9 months long, and they take a year to mature. They live to be about 4-5 years old. 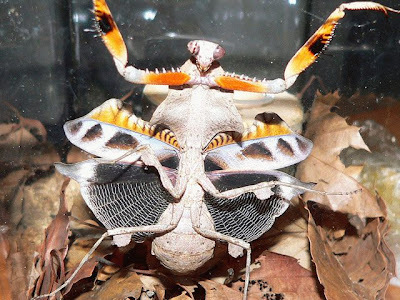 So, if you're patient, and are really itching to get your hands on some rare roaches, these just might be the bug for you. Thanks for the photos and the info, Jade. It's lamprey time. These fishy parasites are considered a delicacy in Portugal, and fisherman can't snag enough from the freshwater rivers of that country. Check out that array of teeth and imagine what it would be like to be host to one of these monsters. Now imagine eating one, perhaps buttered and pan roasted. I'm honestly torn on this one. 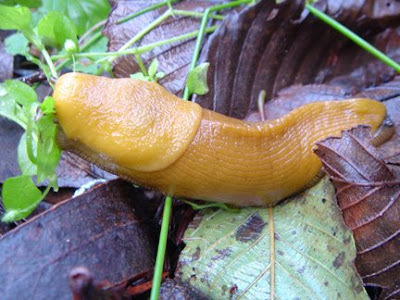 Kat and her son came across these banana slugs while mushroom hunting in Northern California. These mollusks get to be about 8 inches long and produce a thick slime if you pick them up. According to Wikipedia, this slime (which is difficult to wash off your hands) permits them even to travel across a razor blade. 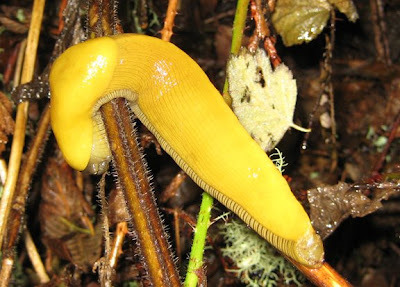 I'm not sure how often banana slugs need to travel across razors, but I'm sure that skill comes in handy. Thanks for the photos and the slug factoids, Kat. 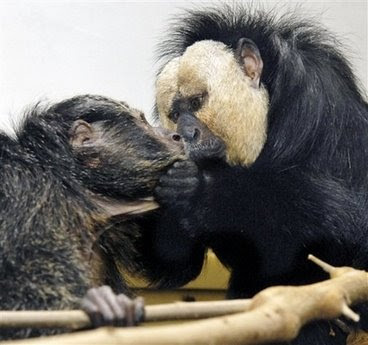 Opus and Winola, Brazilian Saki monkeys housed at the Prospect Park Zoo in New York City, share a kiss. Displays of affection among primates are always so touching (except for those bonobos). Perhaps it is because we feel a particular kinship with our simian cousins. What human female wouldn't appreciate such attention and tenderness from her human male mate? What human male doesn't envy those cheek pads, hairy face, and thick mane? 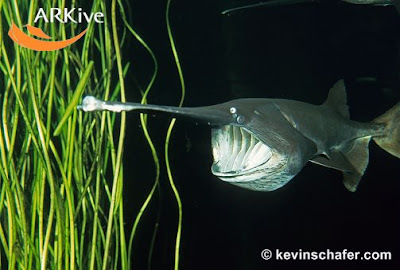 Say hello to the Mississippi Paddlefish, aka Polyodon spathula, Spadefish, Spoonbill Catfish, Duckbill Cat, etc. 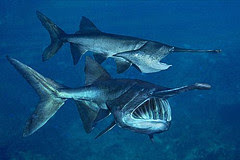 Reaching seven feet in length, and a whopping 220 lbs, the paddlefish is one of the largest freshwater fish out there. They are natives of the Mississippi River basin and are cousins to the sturgeon. They are a popular source of meat and caviar. Those big mouths allow them to feed on their food of choice: zooplankton. Those elaborate snouts are arrayed with sensitive electroreceptors that allow them to locate prey and spawning sites. I was once swimming in Lake Holiday in Washington state, when a large carp brushed against my leg. It was a terrifying experience for me as a six-year-old. I cannot imagine what my reaction would have been if I had had an encounter with one of these. I never had plans to swim the Mississippi to begin with, but this seals the deal. Thanks for the paddlefish, Ida. Our resident invert breeder extraordinaire, Jade, has a new friend he wants to share with us. 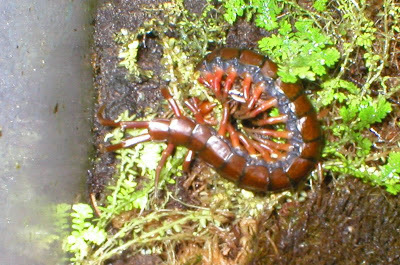 It is a Chinese red centipede (Scolopendra sp. 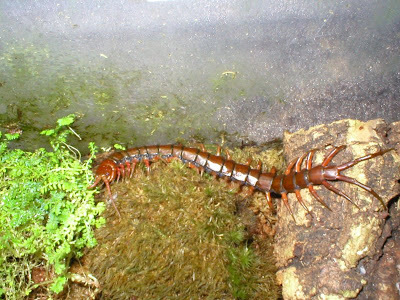 ), now 6" long, soon to be 9" long. He is very mean and his venom is very, very potent. The two photos in which he is curled up show him in the process of devouring a roach. My eating style is similar, which has gotten me kicked out of more than one all-you-can-eat buffet. 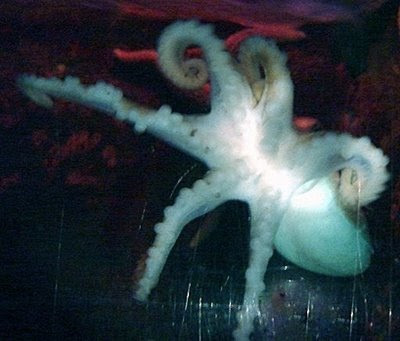 Many people have debated for centuries whether there is room in the eight-legged world of octopuses for a six-legged individual. Well, we are about to find out. Say hello to the world's first hexapus. His name is Henry, and he lives in the Blackpool Sealife Centre in Britain. I really hope that the other cephalopods don't gang up on Henry. What's two legs among so many? 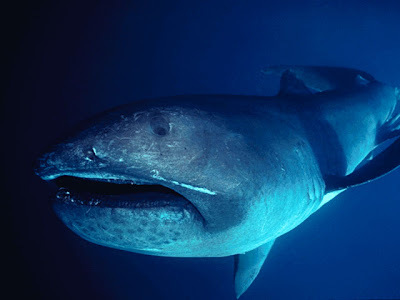 You're looking at the rarely seen profile of the megamouth shark (Megachasma pelagios). These fish are so rare, that they were only discovered in 1976, and only 39 specimens are known to have been caught or sighted as of 2007, with three recordings on film. Like the basking and whale sharks, it is a filter feeder, and swims with its enormous mouth wide open, filtering the water for plankton and jellyfish. They can get as big as 18 ft, and weigh as much as 2,600 lbs. I'm amazed at how large fish and mammals can get filter-feeding on plankton. I've gotten quite large, but I've fed mostly on ice cream and candy and large portions of everything else. It's a mystery to me. It would appear that family meal time is as important among red titi monkeys as it is among humans. Though, mommy and daddy would do better not to bicker over the last twig. What I like about this photo is that Thiago, the male, is the one carrying his four-week-old son on his back. This is common among red titis. While both parents are involved in rearing the offspring, it's the male who does most of the carrying and playing. You can find Thiago, Yara, and their son in the rainforest biome at the London Zoo.